Ironically, ten years after these early warning signs the Corrib Gas project remains incomplete and Shell E&P Ireland continues to be embroiled in controversy. Last week's fiasco involving a heavy goods vehicle underlines many of the concerns expressed by An Bord Pleanála in that six-page letter a decade ago. The planning appeals board was convinced that the remote North Mayo site, with its bog-land topography and network of narrow, winding roads, was wholly unsuitable for an infrastructural scheme of the magnitude of Corrib. Yet the project went ahead anyway, railroaded through the planning and legal processes on the spurious notion that the search for a new site would unnecessarily delay the delivery of gas to Ireland. The truth is that nothing could have delayed the project more than the community impasse that has escalated in North Mayo over the last decade. Residents have been pitted against each other, gardaí have been forced into invidious positions and outside influences have poured petrol on a conflagration of local emotions. The result is that a decade after An Bord Pleanála initially expressed concerns about the proposed site at Ballinaboy, Shell E&P Ireland is still several years from delivering gas from the Corrib field. The manner in which Shell has been allowed to effectively flout the planning laws in Erris during the past decade is deeply disturbing. There are many private contractors who must have viewed last week's events with utter astonishment. Ordinary builders have ended up on the wrong side of the local authority for far less than the blocking of a public crossroads for the best part of a working week. The fact that Shell E&P Ireland will not even receive a monetary fine for its wholly inadequate attempts to deliver a tunnel-boring machine to its final destination is simply incredible. What the council is effectively saying is that it is perfectly acceptable for a heavy goods vehicle - one of the largest ever seen in the West of Ireland - to be left stricken on a public road while its owners figure out a way to extricate it from its ignoble resting place. There is a rich irony in the events of last week. Locals involved in the Corrib Gas protest have received criminal convictions for blocking roads. But when Shell blocks a road it is slavishly faciltated by the local council and up to 150 gardaí - all paid for by the taxpayer. Such double standards have been a characteristic of the Corrib project since the summer of 2002 when Shell commenced work in Glengad weeks after An Bord Pleanála ordered it to identify alternative sites for the Corrib terminal. 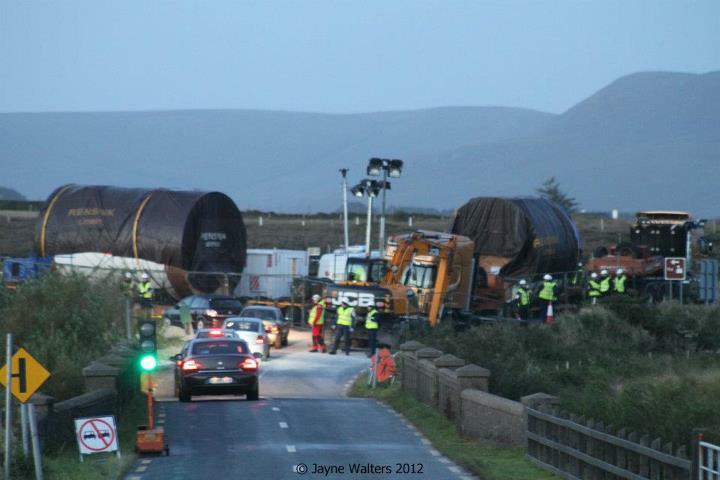 Most independent observers who looked at the photographs of the stranded lorry and its monstrous 160-tonne load, set against the backdrop of the remote and forbidding North Mayo landscape, would have found it impossible not to agree with An Bord Pleanála's original contention that Ballinaboy is the wrong location for this project. But the sad truth is there is no turning back. The dice have been cast, the terminal is built and all that is needed now is the final piece of the jigsaw, namely the high-pressure onshore pipeline from Glengad to Ballinaboy. Yet anyone who has passed a few leisurely hours solving a jigsaw puzzle will know that if you don't begin smartly the final pieces can be very difficult to put in place. The jigsaw that is the Corrib project has been a very messy undertaking, and those charged with solving it have too often resorted to forcing the pieces into place. Last week was just another embarrasing chapter in the sorry sage that is the Corrib Gas project. In the past, Shell has attempted to blame its failings on protestor activity but it didn't even have the solace of that excuse this time around. The blame was entirely the company's own. It's often said that the best way to finish a job is to start it well. We are not a decade on from the summer of 2002 and Shell E&P Ireland is still attempting to force together the final pieces of its complex Corrib jigsaw. Give the farcical nature of what has gone before, we will continue to expect the unexpected.